TELP's 1.3a Patch fixes game-breaking bugs (digital distribution versions already include this patch). For Windows 8 and later apply the fullscreen fixes and run in 32-bit color. CD key. SafeDisc DRM[Note 1]. Pre-patched with TELP's 1.3a Patch. TELP's 1.3a Patch fixes many game-breaking bugs. Digital distribution versions already include this patch. 32-bit color mode slightly enhances visual quality and also fixes a freezing issue on Windows 8. Change "screendepth" "16" to "screendepth" "32"
Change "BitDepth" "16" to "BitDepth" "32"
Delete or rename 3DOLogo.bik, Intro.bik and New World Logo.bik. The game will now launch immediately from that shortcut. 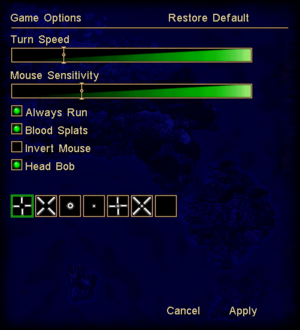 <path-to-game>\autoexec.lith contains special settings that can't be changed in-game. 800x600 only; changing in autoexec.cfg breaks menus. 800x600 only; changing resolution in autoexec.cfg breaks menus. 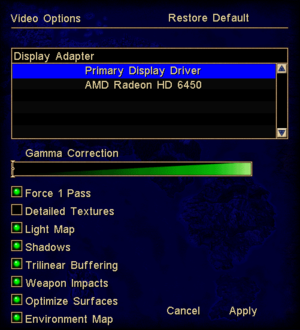 Force in the graphics card control panel (may cause lines on the interface). Go to the shortcut's properties. Add +windowed 1 to the target. The window cannot be moved and may cause NPCs or even the whole game to run at inhuman speeds (try to change in autoexec.cfg "MaxFPS" "0" to "MaxFPS" "75" and it might fix this and mouse problem). All conversation dialogue is subtitled; FMV cutscenes have no subtitles. EAX 2. Disabled by default. A window border is visible in fullscreen mode on Windows 8 and later. 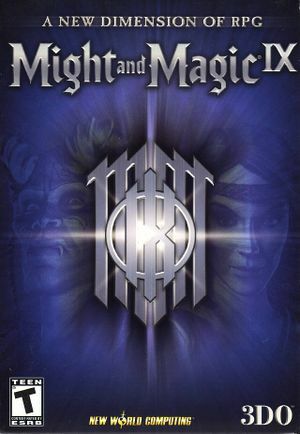 Download the Might and Magic IX fullscreen fixes. 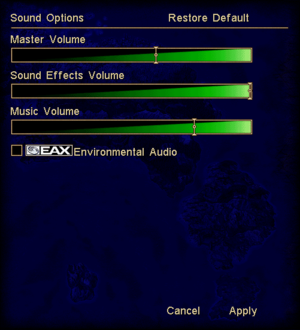 Might and Magic IX will now enter fullscreen mode correctly (you do not need to restart your computer). Applying this fix will cause the Windowed mode border to disappear (use uninstall.bat to remove the fix). Menus freeze on Windows 8 and later if the game is running in 16-bit color (the default mode). Set the game to run in 32-bit color. Menus will now work correctly. ↑ This works by applying the ForceSimpleWindow compatibility fix to this game's version of lithtech.exe (other LithTech games are unaffected).